I'm looking into starting my large format journey and I am having trouble finding/deciding on an enlarger. Does anyone have any good recommendations? You might find an older condenser enlarger like a Johnsons V45, Blumfied, or similar quite cheap (or even free), but they need quite a bit of height above the bench. At one time there were a lot of De Vere 504 enlargers on Ebay, these are redoubtably the best 5x4 enlargers, 15 years ago when I bought my 5108 (10x8) there were maybe 30+ 5x4 De Vere's listed and the occasional 10x8. Prices ahve sored in recwent years. The older De Ver 54, 54a, enlargers are OK, but the condenser heads are large, the cold cathode heads a bit old, tubes expensive. Ideally a colour Dichroic head is the best. The floor standing models need plenty of ceiling height. Line & Jones made a budget 5x4 enlarger, they turn up every now and again and there's also the LPL 7450/7451/7452 main differences are the column. As all LF enlargers were built for professional use, they should all be reasonably robust. All LF enlargers need headroom so it's wise to check before you buy. I had a friend who constructed a recess in the ceiling of his cottage. I second Ian's recommendation of De Vere. They are very well built and there are still spares available. Once you have used the waist-level controls you won't want to change. Many people claim that they get smoother and better prints from a diffusion enlarger, although a minority differs. There is plenty of discussion elsewhere on the web. A more significant point is that if you plan to use a condenser enlarger for other formats, you may need to have the correct condensers for that format. Some enlargers are adjustable, but others have interchangeable sets. There may be different format mixing boxes for diffusion enlargers too, but I haven't found any difficulty myself in using the 5x4 box for all formats. I might simply have very low standards. I'm afraid I can't give you a catalogue, because it's a very long time since I bought my own enlarger. There may be other factors that influence you, of course. Have you considered the lens(es) you will be using? Money spent on enlarging lenses is never wasted. Many people claim that they get smoother and better prints from a diffusion enlarger, although a minority differs. There is plenty of discussion elsewhere on the web. I have always held the opinion that if the negative is developed correctly for the enlarging system used, it really doesn't matter condenser vs diffusion. That said, however, back hundred years ago when I used a condenser enlarger I found it a pain to keep the condensers clean. At least 4 members here have been in my current darkroom which is in an out-building at the bottom of my garden with a pitched roof. I had to cut two roof joists and build a section to allow me to use my floor standing De Vere 5108 at the top of it's column. The 504 uses the same frame. In a previous darkroom, about 30 years ago, I struggled for height but got around this by having my Johnsons V$5 and Durst M601 mounted directly on the rear of the bench and had a removable section that could be removed and slotted in at different heights the lowest just above floor level. You can't do this with the De Vere 504 bench models but you could I think with an LPL. Don't forget the drop-bed feature on the floor-standing versions. I'm sure you're right. It's a while since I read Ilford's instructions, but they used to give developing times for both kinds of enlarger. There may be some genuine differences. With smaller formats, grain may be more visible with a condenser enlarger and alignment of their optical system will be more critical. Neither are insurmountable problems. I suppose we should mention the proposed Intrepid system. As far as I know, it's not available yet, but there is information on their site. Even if it's not the ideal enlarger, it's not intended to be that, but a way of dipping toes in the water until you meet your perfect darkroom partner. Yes David I should have mentioned the floor standing models allow the bed to be dropped to a few different levels. Choice of enlarger lens is critical as well, in tight situations a 135mm is beneficial for 5x4, there's no difference in print quality between my 135mm Componon and 150mm Rodagon on 24x20 and larger prints. I switched to a cold cathode with my firts Johnsons V45 much easier to print with as is a colour or Multigrade head, I found the same with my 35mm/120 Dursts. From practical experience over a significant number of years,... with numerous different brands of enlargers and... If I had the 'cash-in-hand' to 're-invest' in a new enlarger, the topmost on my list would be a 'big' Durst that would 'allow' me the benefits both tungsten AND point-source illumination. Big Durst's are much rarer in the UK than De Vere's. I had a De Vere 54a and essentially it had a point source head it was used for large enlargements. 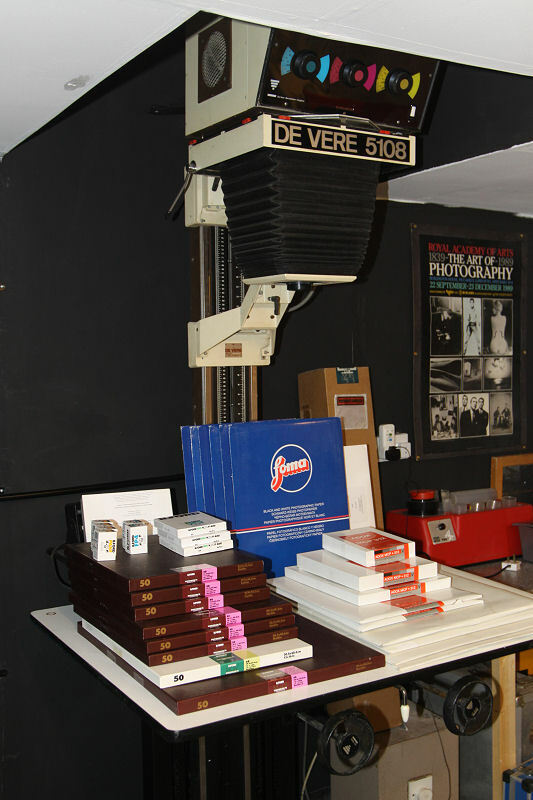 The owner of my local pro-lab (recently closed) was actually an ex Durst UK engineer he used De Vere enlargers and Durst roll-head printers. I went to the lab one day about 16 or 17 years ago and most of the enlargers were in a skip, critical bits were damaged beyond repair at a time when you could get a good 504 for under £100. I paid £600 for my 5108 a year or so later and it came with 4 lenses and a large Beard easel. Sold separately they were worth more than I paid for everything. If cost is an issue I'd get a condenser enlarger and convert it with a home made LED head, there's details online. Looks interesting if you have the room. I am assuming this id going to need quite a bit of head room when installed ? My favorite enlarger is a Fujimoto 450M-D, has a simple opal bulb and perfekt mechanics. I also have Omega D2 and a De Vere 507 which is great for large prints since you have focus knobs at paper table. You'd need somewhere around 64" above the bench to get maximum height with that De Vere 504 bench model. Enlarger columns can't be shortened and there is a very strong counter balance spring. I've just commented in another thread about the problems of back ache if you have an enlarger base-board much lower than bench height. The De Vere's have the focus and height adjustment wheels at the front under the base board, they don't show in that advert but they will be there. This means you can't bench or wall mount with a bench section that can be dropped. There's an LPL 7450 on Ebay unfortunately missing a few parts, the Canadian LPL distributor makes a wall mounting bracket for them. However it would be easy to get something made here. I had a bracket made to take my Durst M601/605 enlarger which I bolted to the wall, and had a brace for the top of the column as well. As I mentioned earlier the advantage is you can have a section of bench that sits flush or can be slotted in lower for bigger enlargements overcoming ceiling height issues. Many thanks for all of the excellent advice! I had already noticed the 504 Mr Barber recommend on eBay and am currently bidding for it however I suspect its going to go over my current budget so I may have to spend some time saving and then have another go at it. That is unless someone has a 504 or something similar that they are willing to part with for a reasonable price to a good home! Hi Charlie, If you would like to go into old american enlarger history I could sell you a Omega D2 with all you need. 3 Lenses and film holder from 35 to 4x5. I'm from Germany so shipping isn't easy but possible. Be aware that lens boards can be expensive, also that the timer may not work. However the timer and the Stabiliser can turn the enlarger on and off, so with the wrong combination of the switches the timer won't work. It's not simple wiring though !! !